If you’re reading this, it means you’re visiting the Miketendo64 website and it is Let’s Talk About time! So, long story short, according to you guys, the line-up, while it is a bit full-on, especially on our wallets this moment, it’s not too much at all, but just right and who am I to say otherwise? 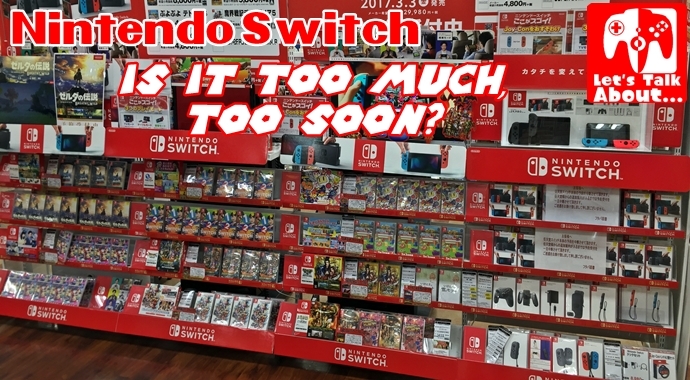 It is in my opinion as there are just way too many games to keep up with, that it is so easy for other games to end up forgotten, the Switch is a success and games are selling spectacular, so whatever Nintendo is doing, they’re clearly doing it right and let’s leave it at that. This has been another of our revised instalments of Let’s Talk About. Thank you reading, thank you for supporting the series and if you wish to join in with the conversation, you can do so below by leaving a comment. Until the next instalment, keep on gaming!